There is nothing quite like having a spot of solar energy or solar power to help juice up our devices or mobile gadgets, as the sun’s energy can be considered to be inexhaustible in our lifetime, and it is free to use as well as “green”, so to speak. Well, what better way to harness the power of the sun than a bunch of solar panels brought together? 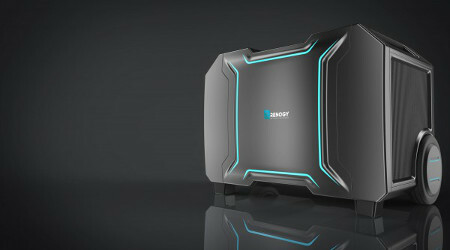 Renogy has just revealed the Lycan Powerbox, and this has nothing to do with werewolves and other mythical creatures. Rather, the Lycan Powerbox is touted to be the first personal energy solution in the world which is able to transform the power of the sun into easy-to-use and dependable energy. It comes in the form factor of being a quiet, efficient and pollution-free portable solar generator, making the Lycan Powerbox ideal for both indoor and outdoor use, and is also the first of its kind in the world to boast of a swappable lithium-iron phosphate battery, which is touted to be the most reliable and cleanest battery in the world. The Lycan Powerbox can be said to be an ideal power source for camping, tailgating or survivalist excursions, being waterproof in nature while boasting of a rugged exterior that allows it to weather any environment, heavy-duty wheels for effortless movement, and extended handles that make it easy to maneuver on any setting. Being different from conventional gas generators which will make use of motors and discharges fumes, the Lycan is 100% battery powered, which means it is safe to use indoors during emergencies, and can also help to reduce energy related expenses. The Lycan Powerbox will feature a maximum solar input of 300 watts, where it can be fully juiced up in just 3 hours with a trio of solar panels. Not only that, when the sun’s out, you can charge it through wall outlets and by using car charging inputs. There are built-in USB and AC/DC outputs which are compatible with a full range of devices and appliances, and it is currently available for pre-order on Indiegogo.com for the discounted rate of $1449, carrying a MSRP of $1799.